Yesterday Mrs Speech and I went for our longest walk yet. It took us the length of the Bulimba Creek bikeway, down Wecker road (the boring road), up an horrific hill that could have doubled as the downhill slalom for the Winter Olympics, and then basically through Mansfield and Wishart till we got home after 6:30. We left around 4:30. And to our delight, we had not one but two brushes with scrub turkeys. Bridge across the River Kwai, it ain't. But still kinda pretty. The first one was behind Broadwater Park. It was manoeuvred into us by another family which approached it from the northeast. Scrub turkeys are extremely skittish (maybe 'cause they know cranberry sauce goes so well with them) and they dodge humans before you can get anywhere near them. This one though, ambled hastily down the path to Mrs Speech and I, desperate to escape the clutches of the family stampeding through the bush. It came within a couple metres of us as I urged Mrs Speech in hushed tones to not move. It headed off into the undergrowth. The second one was scrounging for food near a temporary fence erected around some improvements to the path, being done near a bridge over the creek, a little way down. It scattered quickly down the gully. The video is not nearly as compelling. Our phone camera is a scrappy affair that needs to be upgraded smartly. It does however take nice pictures of angels. We met a guy on our walk who we recognised from a couple weeks back. The first time we saw him, on the bikeway, he asked me if there was something further down to be concerned with. He had seen me waving my hands around like a crazy guy and wanted to know what to look out for. It was just a spider web. Okay so it's not an angel. As I said, we need a new phone camera. We said hi to him and moved on. On Newnham road, we had an interesting experience. A cop car did a u-turn right into our section of the pavement, tires squealing in high-pitched stress not five metres from us. Seemed totally unnecessary given that they didn't light up the siren or anything. There's a donut joke to be made somewhere but I shan't. We arrived back after dark to find the NRL Grand Final still on, so that was nice. I like me some football. Except when a guy's ear gets chewed. That's not fun. 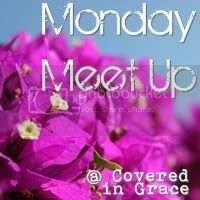 Mrs Speech is linking this blog post up with Covered in Grace's Monday Meet Up! And, reminding you to go enter her fabric giveaway which ends October 3, 2012 EST and is open worldwide. Sounds like a very enjoyable walking adventure! We should have. But you wouldn't believe how flighty they are. This guy only came so close to us because we were still and the other family resembled a pack of elephants!